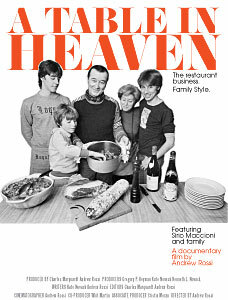 A Table In Heaven (2007, Director: Andrew Rossi): Sirio Maccioni first opened Le Cirque in New York in 1974, after years and years of working his way up from busboy to waiter to maître d’hôtel. His star rose through the 70s and 80s and the restaurant attracted the rich and famous, including Henry Kissinger, Pope John Paul II and President Ronald Reagan. But as the film begins in 2004, the place has grown a bit stale, and the crowd of old regulars (and the emphasis is clearly on “old”) are dying off and no new customers are replacing them. Sirio decides to close and reopen in a new location. With his three sons Marco, Mario and Mauro, he sets out to plot the future of the family business. A new restaurant will be a fresh start, with a new location, a new chef, a new menu, and a new attitude. At least that’s what the younger generation wants. Sirio is from the old school, though, and is not willing to give up his micromanaging ways. Andrew Rossi’s camera was there to capture it all: Sirio’s charming tale of an uneducated Tuscan immigrant made good, his years of building relationships with New York City’s most rich and famous denizens, the gradual fading of his reputation, and then his family’s often fractious effort to get their groove back. Though it seems at times like a particularly rancorous episode of the Food Network’s Opening Soon, there are greater forces at work in the Maccioni story. Sirio complains bitterly of getting old, and refuses to retire. And yet the restaurant culture has changed and passed him by. His sons recognize this and want desperately to attract a younger clientele, but Sirio’s loyalty is to the people who helped him make it, and it hurts his new venture. Resistance to change is really about the fear of oblivion (through death and forgetting) and Sirio’s struggle is one that all of us can understand. Luckily, the story doesn’t end when the film does, and it appears that the new Le Cirque is finally adapting to the new environment. Instead of singling out celebrities and treating everyone else as second-class citizens, the new culture prefers that everyone have the same experience, and from all accounts, they’re trying. The menu has been freshened as well, despite Sirio’s objections. A bad review from the New York Times, along with the footage of the opening, made it painfully obvious that the restaurant needs more than nostalgia and a charismatic owner to appeal to the new generation of diners. Rossi has captured more than a restaurant or a family story. He’s given us a glimpse of a man on the run from his own mortality, a man who’s cultivated “friendships” among the most visible and powerful only to realize that it won’t save him in the end. It’s heartbreaking and a little bit terrifying. For me, the most satisfying moments are not in the restaurant at all, but around the table when Sirio’s longsuffering wife Egidiana serves up a simple meal of pasta to the whole family. It’s a shame that the man has so little time for that sort of meal. This entry was posted in Doc Soup, Documentaries, Film Festivals and tagged Doc Soup, Documentaries, Toronto Film Festivals. Bookmark the permalink.